NVIDIA has been doing something interesting of late by making and releasing its own devices with Tegra SoCs inside. We first saw Shield, a handheld gaming console with Tegra 4 inside, and today we’re taking a look at a 7-inch tablet packing both Tegra 4 and new inking capabilities called Tegra Note 7. The 7-inch tablet market has rapidly evolved from being a platform with unproven size and form factor benefits compared to ever-larger smartphones, to a mature platform with the same rapid cadence that the larger 10-inch form factor has. You could make the case pretty easily that much of the 7-inch category was catalyzed by the Nexus 7. 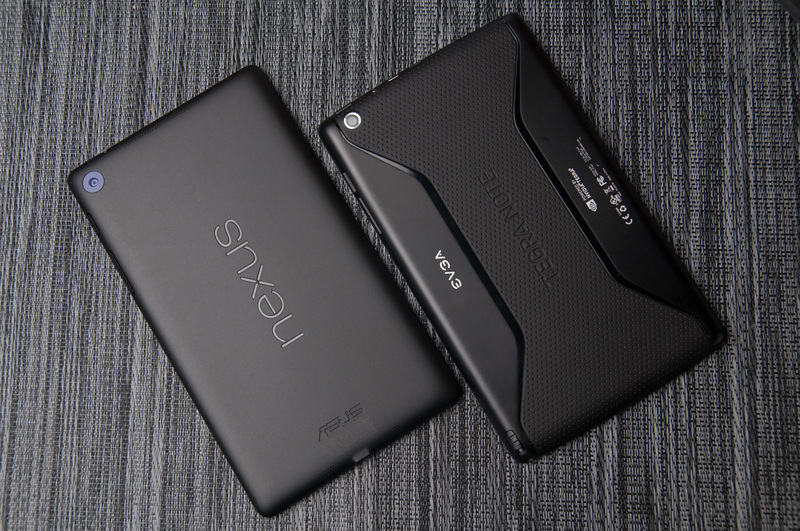 With the original Nexus 7, we saw Google, ASUS and NVIDIA upset the market with hardware that was very competent at a very affordable price. Nexus 7 was a Project Kai device, a device aimed at bringing premium features to a lower price point without making huge sacrifices in features, build quality, or overall platform. Since the launch of the original Nexus 7 and its successor, Nexus 7 (2013), it’s been hard to really recommend any other Android tablet. 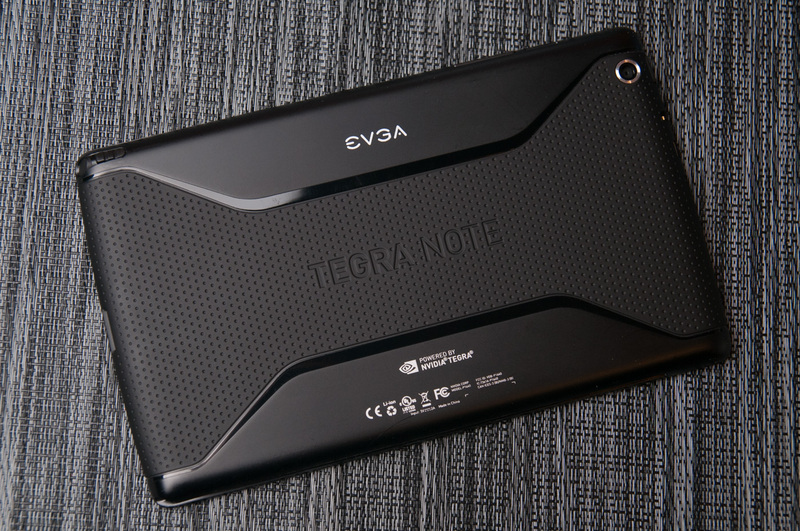 With Tegra Note 7, NVIDIA is taking Kai a bit further by supplying more than a reference design, recommended set of components, and potential suppliers. Instead, it has built a complete tablet platform ready for its partners to take to market. The strategy has parallels to NVIDIA’s GPU business, with EVGA responsible for support and sales of the Tegra Note 7 in the USA for example, while the full list includes partners like PNY, ZOTAC, Gigabyte, and Xolo depending on region. Tegra Note 7 isn’t strictly a Kai device, but rather an extension of the project in a rather direct fashion. Of course, you can make the logical reach that to some extent the Tegra Note 7 fills a platform slot gap – namely losing the Nexus 7 (2013) to Qualcomm, but it does still do some things differently. The Tegra Note 7 (formerly Tegra Tab) story starts with platform, which consists of a Tegra 4 SoC clocked at a maximum single core clock of 1.8 GHz (slightly lower than the 1.9 GHz maximum for Shield, with its active cooling), 7-inch 1280x800 IPS display, front-facing stereo speakers, a stylus for inking, and of course a close-to-stock version of Android running on top of it all. There’s also a 5 MP camera on the back with autofocus, and VGA front facing camera. The best part however is price – NVIDIA’s partners will bring the Tegra Note 7 to market at just $199. 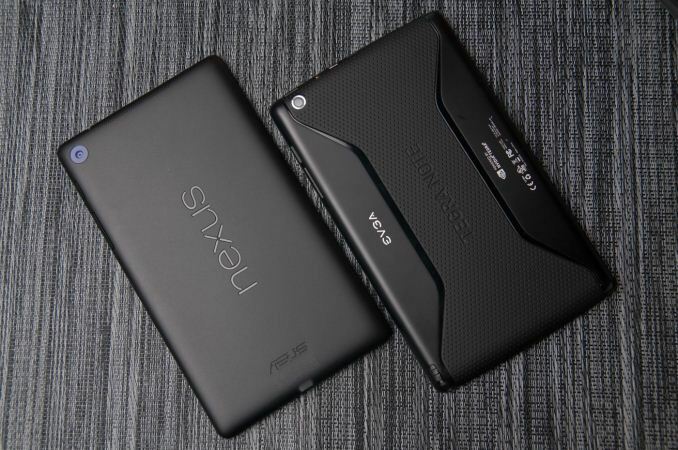 Coming in at the price of the original Nexus 7 makes it obvious that NVIDIA envisions the Tegra Note 7 as the true successor to the original Nexus 7. Of course the obvious comparison is the $30 more expensive refreshed Nexus 7 (2013) with much higher resolution display. 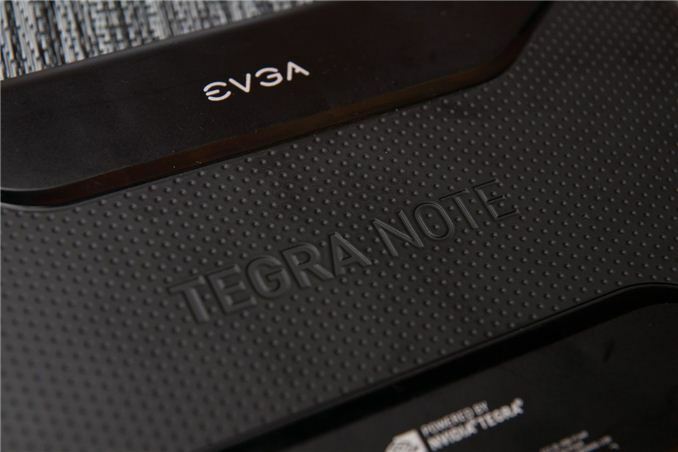 Let’s start with the hardware and design of the Tegra Note 7. Balancing low cost devices and still getting good industrial design is a real challenge for any OEM, and the Note 7 carries a new design that I haven’t quite seen before. The obvious highlight are the two front facing speakers, which give the Tegra Note a superficial similarity to another device with front facing speakers, the HTC One series. At first glance, I made a remark that the Tegra Note almost looks like a blown up HTC One from the front. 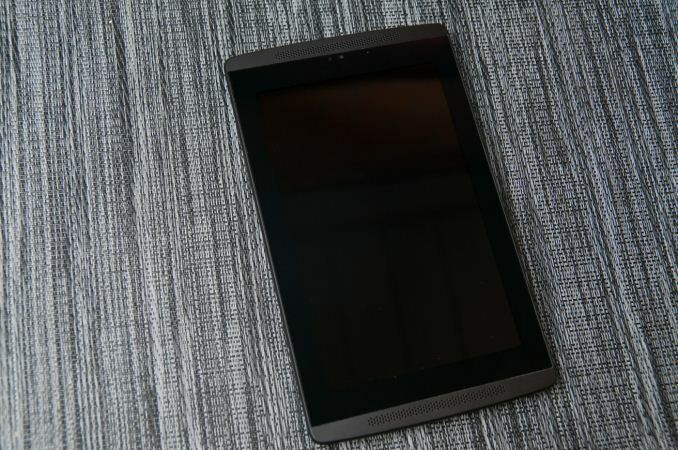 The Tegra Note doesn’t make the mistake of being entirely slick plastic like so many other tablets, instead it has a combination of slightly rubberized, dimpled material, and lightly textured plastic. 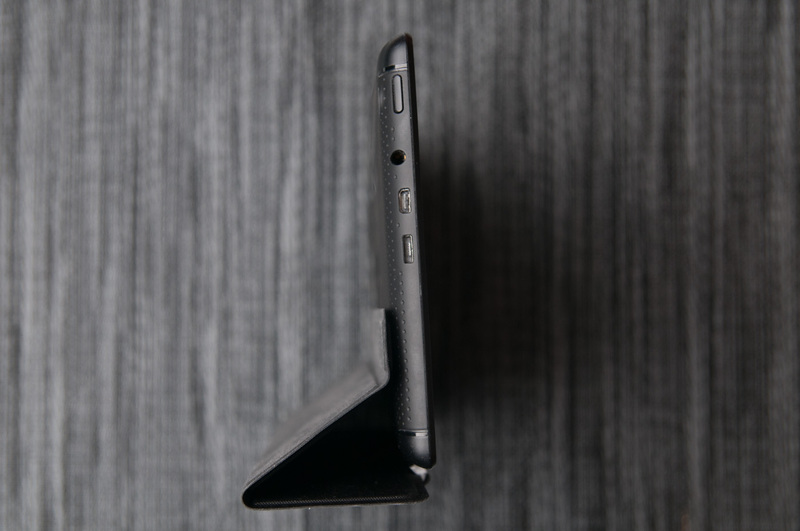 The industrial design seems to take a nod from the dimpled rubber back of the previous generation Nexus 7 and replicates it here, although with a bit less rubber tack. The two plastic regions on the side break up what would otherwise be a homogenous flat surface. There’s Tegra Note written across the device in landscape, and of course the logo of the partner responsible for supporting the device as well (in this case, EVGA). At the bottom is a speaker grille for the bass reflex port, and the chamber for placing the stylus inside the device when it isn’t in use. Tegra Note places all the connectivity at the top of the device, microUSB, microHDMI, and the headphone jack are all up top. I guess the Tegra Note is my first encounter with a tablet that places all the I/O up at the top, so it took a bit of getting used to, but the result is that the device doesn’t look (and awkwardly handle) like it’s on a skewer when you’ve got headphones and USB plugged in. 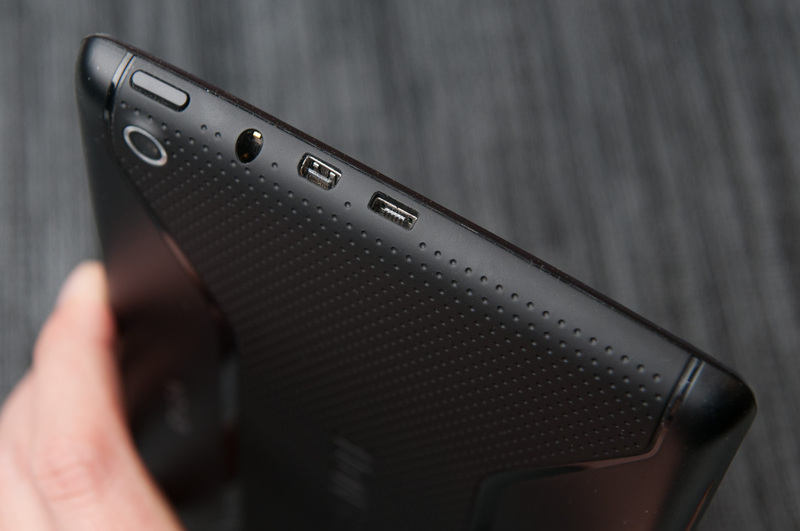 My only big gripe with the design of the Tegra Note is the awkward positioning of the power button just a few millimeters above the rear facing camera. I frequently brushed the cover glass atop the camera and smudged it when trying to power on the Tegra Note, which is unfortunate and frustrating since smudges do degrade captured image quality. On the right side there’s the one piece volume rocker and microSD port, which oddly enough is entirely open unless you have a card inserted, my only other gripe since it seems like dust could easily intrude here. Yes the Tegra Note 7 does include support for microSD cards, although the initial shipping software does not have the ability to move APKs and OBB files over to them, unlike Shield. In the hands the Tegra Note is well balanced and light enough for one handed use. It’s thinner than the original Nexus 7 as well, but still thicker than the new Nexus 7. I don’t find that there’s a whole lot of difference there, both are ultimately really tall, although the Tegra Note is visually more balanced with the front facing speakers than the Nexus 7 which has large bezels at top and bottom. At the end of the day there isn’t much tradeoff between the two, although I do prefer the styling on the back of the Tegra Note to that of the Nexus 7. NVIDIA has done a good job making the Tegra Note 7 industrial design interesting enough to be eye catching, yet not one that breaks the bank. It seems hard for OEMs these days to nail the right balance between affordability (both for them, and for the consumer) without the end result looking and feeling like a reference design. There’s a small bit of creak and flex in the Tegra Note, but nothing deal breaking in my estimation. Flip covers are a popular accessory for tablets, and with the Tegra Note NVIDIA has made one which slides into the slot on the left side and folds over the display when it’s not in use. 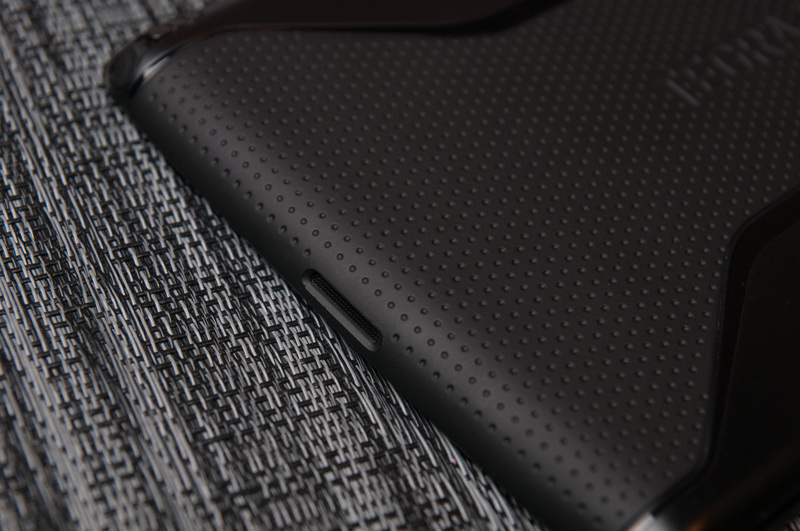 The outer facing side is rubberized for carrying the tablet around, the inside is the usual sort of felt material we’re accustomed to to prevent scratching. 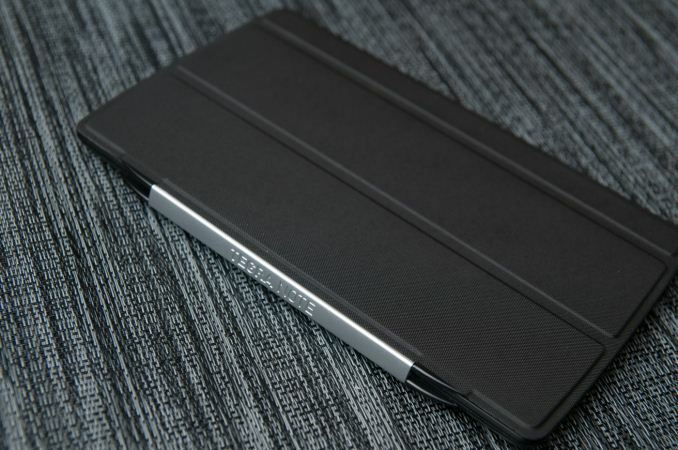 What’s neat about the Tegra Note is that it folds over and works as a three-position stand. There’s three pairs of magnets in the back of the Tegra Note which hold the flip cover in position. The magnets are sturdy enough to allow you to still use the tablet without much additional support, and I like the way this works as opposed to the tri-fold design that Apple has been using for a while now. Opening and closing the cover on the front of the tablet also turns it on and off – there’s definitely a sensor in there for activation. From a hardware perspective I like the design of the Tegra Note, other than the power button being way too close to the camera aperture I don’t have any major gripes. Compared to the refreshed Nexus 7 the Tegra Note is both thicker and wider, but those aren’t really deal breakers either on their own. I keep comparing the two since really those two are competing for a slice of the same category in the Android tablet landscape. What the Tegra Note does have up on the competition however is a new stylus technology.